How have GMOs changed over the years? 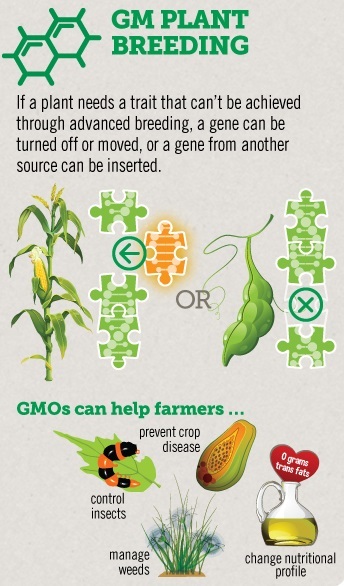 Genetically modified organisms (GMOs) are crops developed with a process called genetic engineering. With regard to GMOs in agriculture, following is a history of crop modification and how we arrived at the GMO crops we have today in modern agriculture. Farmers have been intentionally changing the genetic makeup of all domesticated crops for about 10,000 years. Every fruit, vegetable and grain that is commercially available today has been altered by human hands, including organic and heirloom seeds. The pictures below are examples of nature’s original fruits and vegetables. Without plant breeding of any kind, we would have corn kernels that you would have to crack open with a rock; a banana that is difficult to peel and full of seeds; and broccoli that no amount of cheese could make edible. There are many breeding techniques utilized in modern agriculture including selective breeding, mutagenesis and genetic engineering, among others. Each of these techniques may be used to develop a new plant variety, sometimes in a continuum over many years. For example, seeds developed through selective breeding may be altered through mutagenesis and then altered again using genetic engineering. In the late 20th century, advances in technology enabled us to expand on this knowledge of crop modification through genetic engineering. For years, university, government and company scientists intensively researched and refined this process, a major result of this was GMO seeds. This matrix provides an overview of the different techniques used in modern agriculture. Genetic engineering in agriculture enables plant breeders to take individual traits found in nature and transfer them to another plant, or make changes to an existing trait in a plant. While genetic engineering is the latest technique used in the long evolution of plant breeding, it differs from other techniques by enabling specific, more predictable changes to be made to a plant. Let’s take a look at how modern corn came to be, as this particular crop has a very interesting background. About 10,000 years ago farmers in what is now Mexico took the first steps to domesticate corn by simply choosing the most desirable kernels from a plant called “teosinte” – a plant that eventually evolved into modern day corn. Today, corn now provides about 21 percent of human nutrition across the globe. Over the past century, corn has evolved with the availability of hybrid corn in the 1930s and the planting of GM crops in the mid-1990s. Due to the insect resistance and/or herbicide tolerance of GM corn, more and more of it was planted. 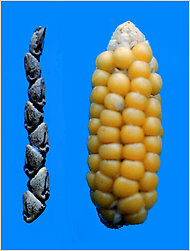 Contrary to popular belief, the development and increased usage of GM corn has not changed the physical appearance of corn. What has changed, due to modern plant breeding, is size, consistency, seed performance, yield, the number of ears per stalk, and the position of the ear and the leaves on the stalk. Currently, a plant has only one ear located about waist high (the height of a combine blade), and its leaves grow at a more upright angle to better catch sunrays and rain. A century ago, farmers planted about 8,000 corn plants per acre. Today they plant about four times as many plants per acre. To better understand why GMOs were initially created and the evolution of crop modification we encourage you to read more here.